Mell Hall was originally a US Post Office. 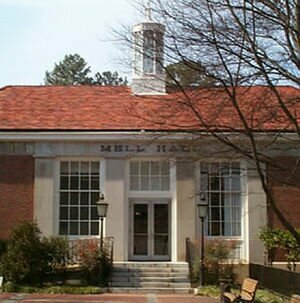 It was completed in 1940 and purchased by Clemson University in 1973. It is on the National Register of Historic Places and is now the home of the Housing Office. The building is on the perimeter of campus, directly across from the Acropolis and TD's, and adjacent to Holtzendorff Hall and Bowman Field. It is named for Patrick Hues Mell, Clemson's fourth president, a native of Georgia and a graduate of the University of Georgia. He was elected on August 30, 1902 and served until he resigned in 1910. This page was last modified on 8 October 2007, at 20:29.